All of our customers need coating solutions. However, every customer’s needs are unique. Many of our customers are developing unique processes and methods that have never been done before. Our Milton, NY in-house ultrasonic coating laboratory* offers customers the ability to test their application, in most cases, using their actual substrates and specific chemistry. Sono-Tek leverages the expertise of our applications engineering team, our in-house coating systems, and precision metrology equipment to coat products. *In addition to our USA testing facility, satellite laboratories are available through our distribution network for companies located within the countries of Germany, Korea, Taiwan, Japan, China, and Turkey. Our experience is your solution. 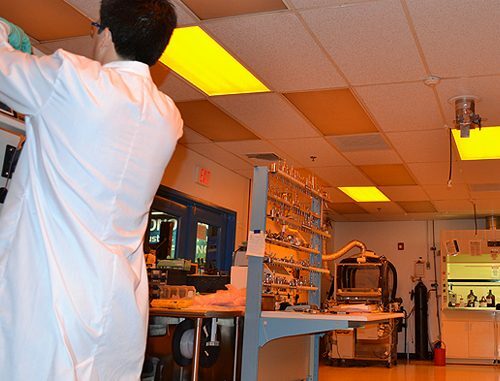 We have over three decades of experience coating a wide range of substrates and testing spray-related processes for companies in several industries including medical devices, semiconductors, electronics, energy and textiles. The expertise of our laboratory staff has helped thousands of customers develop processes utilizing our knowledge of how to optimize the performance of our ultrasonic spray systems. Practical testing of theory using actual process parameters and precision tools, operated by our spray technology experts, produces optimum precision and efficiency and results in significant savings for our customers. Increased throughput and minimized excess overspray while providing uniform coverage over a wide area in a float glass spray application resulting in a 75% reduction in material usage. Achieved precise drop size requirements in spraying of microparticulates in medical applications, such as drug delivery. Developed a highly effective process for spraying of nanoparticle solutions with significantly less agglomeration than conventional methods. Developed a process for applying flame-retardant solutions to fabrics. Optimized thin film coatings from 5μ down to .1μ and increased uniformity from ±10% down to ±2%. Optimized coating morphologies from a grainy (porous) structure to continuous (glossy) smooth films. Reduced consumption of expensive drug/polymer solution being sprayed by 80% – saving the customer $14,000 per month with a 2 month ROI. Sono-Tek’s team of application engineers provide direct customer support throughout every step of the process. Our global distribution network includes local language support for many countries. Select an icon on the map for location information.